Competitive Examination. There are total 571 vacancies of Revenue Officer posts available in this BPSC Revenue services recruitment. Those who are interested in this Revenue services vacancies and having required eligibility criteria they can apply online from 03-08-2018 to 20-08-2018 through online @ Bihar PSC official website of BPSC.bih.nic.in website. BPSC Revenue Officers recruitment of will be through 64th combined competitive examination. BPSC CCE exam consist of prelims exam and mains examination. category wise vacancy details, how to apply online, age limits, selection process, preliminary exam pattern and syllabus, and other details for BPSC Revenue Officer (Rajaswa Padadhikari) recruitment exam notification 2018 is given below. Candidates who are qualified Bachelors degree they are eligible to apply online for this BPSC recruitment of RO Rajswa Padadhikari jobs. 64th Combined Competitive Exam age limits are 22-37 years for General Male Candidates. 22-42 years for SC/ST Male/Female candidates. For Female candidates of BC/MBC and General and BC/MBC male candidates age limits are 22-40 years. 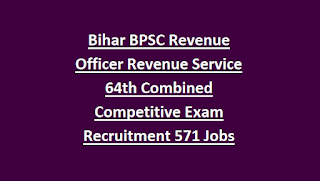 Selection for this Bihar Revenue Serives BPSC Revenue Officer recruitment will be held based on CCE Combined Competitive Preliminary Exam and mains written exam. Combined Competitive Preliminary Test will be conducted for this BPSC RO jobs for 150 marks. Paper will be in objective type only. Those who are qualified for the preliminary Exam they have to apply separately for Mains Examination (Mains Exam is Descriptive type) and fee to be paid separately. For SC/ST/PH exam fee is Rs.200/- and for others Rs.750/-. Pay the application fee either offline of online as per the given instructions at the time of online form submission. Applicants have to submit application form online for this BPSC 64th Combined Competitive Exam through the official website of www.BPSC.bih.nic.in only. Read the official notifications carefully before applying online and then proceed to apply online. Click here to apply online for the BIHAR PSC Revenue Officer Recruitment 2018. 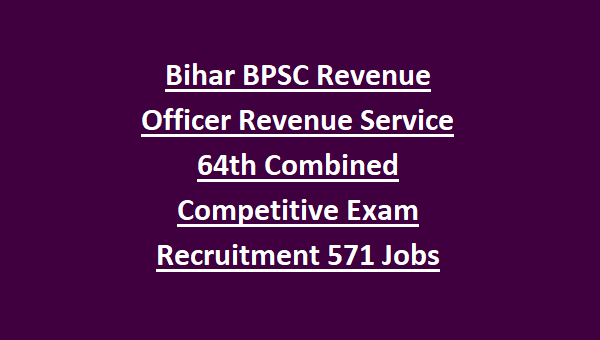 Click here to see the official notice of BIHAR PSC RevenueOfficer Recruitment. Please share this BIHAR PSC Revenue Officer (Rajaswa Padadhikari) Recruitment Exam 2018 article to your friends.